Bellinzona is the capital of the canton Ticino in Switzerland. The city is famous for its three castles that have been UNESCO World Heritage Sites since 2000, the town lies east of the Ticino river, at the foot of the Alps. It stretches along the valley, surrounded by the southern ranges of the Lepontine Alps to the east and west. The toponym is first attested in 590 in Latin as Belitio or Bilitio, the name is Lepontic in origin, possibly from belitio or belitione. During the medieval period, the name is found as Berinzona, Birizona and Belinzona, the German name of the town is Bellenz. A local folk etymology derives the name Bellinzona from zona bellica war zone, the blazon of the municipal coat of arms is an erect serpent in silver on a red field. The fabulous animal is called in Italian Biscione and this animal, which can be found on the arms of the Alfa Romeo car company, is linked with the Visconti family, who were feudal lords of Bellinzona in the 14th and 15th centuries. Bellinzona has always occupied an important geographic location in the Alps, to the south, the Po valley is accessible by a lowland route down the valley of the Ticino river and by Lake Maggiore. To the north, the valley of the Ticino leads to the alpine passes of Nufenen, St. Gotthard, Lukmanier. Although now little used, the San Jorio Pass to the east was important in Bellinzonas past. While the region has been occupied since the early Neolithic age it wasnt until the late 1st century BOT that a fort was built in the area during the reign of the Roman Emperor Augustus. While the fort fell into disrepair in the centuries, it was rebuilt. During the reign of Diocletian and Constantin a chain of castles, Bellinzonas location was recognized as a key point in the defenses and a large castle was built to protect the walls. The town that grew up around the fortifications was known as Bilitio, under the Longobards, Bellinzona became the site of a permanent garrison to protect the region from raids by the neighboring Frankish and Alemannic tribes. From Bellinzona the Longobards controlled the traffic on the important trade route from Varese over Ponte Tresa, some researchers believe that Bellinzona may have been the capital of a county that included most of the valleys in Ticino. Dietikon is the fifth biggest city of the canton of Zürich in Switzerland, after Zürich, Uster and Dübendorf. It is the capital of the district of Dietikon and part of the Zürich metropolitan area. The industrial city Dietikon is situated at an elevation of 388 m at the confluence of the Reppisch, here and in the neighboring region, Spreitenbach, is the large Limmattal rail freight marshalling yard. Dietikon has an area of 9.3 square kilometers, of this area,17. 2% is used for agricultural purposes, while 27% is forested. Of the rest of the land,49. 1% is settled, in 1996 housing and buildings made up 33. 8% of the total area, while transportation infrastructure made up the rest. Of the total area, water made up 4. 9% of the area. As of 200740. 7% of the municipal area was undergoing some type of construction. The largest and best known forests of the municipality include the Honeret, Guggenbüehl, the Honeret forest lies on a side moraine of the Linth glacier. There are over 200 prominent stones through the woods, up to erratic boulders as big as 25 m2, the Honeret and the Guggenbüehl-Wald are separated by only one main street. In the forest, there are a few springs from which the brooks Tobelbach and Stoffelbach rise, in the forest lies the forest cottage Lorenzhütte. The Guggenbüehl forest lies wholly within Dietikon, within the forest lies the Giigelibode pond. It has neither inflow nor outflow, a Vita course is in the forest. The municipality is located on the A3 motorway, Dietikon railway station and Glanzenberg railway station are stops of the S-Bahn Zürich on the lines S3 and S12. Dietikon railway station is the terminus of the line S17 provided by the Bremgarten-Dietikon-Bahn, important running waters that flow through Dietikon are the Limmat and its tributary Reppisch. Wide brooks are the approximately 3 km long Schäflibach and the Teischlibach, the Schäflibach is created with the flows together from Allmendbach and Stockacherbach and leads into the Limmat. The Teischlibach originates from Röhrenmoos in the forest above Dietikon and leads into the Limmat, the Marmoriweiher lies in the Grunschen a place used for gaming and grilling. Grenchen is a municipality in the district of Lebern in the canton of Solothurn in Switzerland. It is located at the foot of the Jura mountains between Solothurn and Biel, approximately 25 km north of Bern, with over 16,000 inhabitants, it is one of the larger towns of the canton of Solothurn. The city is known for its watch industry, that has been present for more than 150 years. Grenchen is the 2008 winner of the Wakker Prize for architectural heritage, jura-Sternwarte Grenchen is located at Grenchen. Around 1000 AD, the local barons built a castle on the cliff that was inhabited for three centuries. The name Grenchen was first documented in 1131 as Granechun, the name comes from the gallo-romanic graneca, meaning by the granary. 1851, Clock manufacture begins 1918, General strike Grenchen has an area, as of 2009, of this area,9.85 km2 or 37. 9% is used for agricultural purposes, while 10.42 km2 or 40. 1% is forested. Of the rest of the land,5.39 km2 or 20. 7% is settled,0.34 km2 or 1. 3% is either rivers or lakes and 0.05 km2 or 0. 2% is unproductive land. Of the built up area, industrial buildings made up 2. 2% of the area while housing and buildings made up 9. 7%. While parks, green belts and sports made up 1. 4%. Out of the land,38. 5% of the total land area is heavily forested and 1. 5% is covered with orchards or small clusters of trees. Of the agricultural land,25. 8% is used for growing crops and 6. 0% is pastures and 5. 3% is used for alpine pastures, all the water in the municipality is flowing water. The municipality is the capital of the Lebern District and it is the second largest city in the Canton of Solothurn. The municipality stretches from the hamlet of Staad along the Aare river, the blazon of the municipal coat of arms is Gules a Ploughshare Argent. Grenchen has a population of 16,741, as of 2008,28. 7% of the population are resident foreign nationals. Over the last 10 years the population has changed at a rate of -1. 3%, most of the population speaks German, with Italian being second most common and French being third. There are 16 people who speak Romansh, as of 2008, the gender distribution of the population was 49. 2% male and 50. 8% female. La Chaux-de-Fonds is a Swiss city of the district of La Chaux-de-Fonds in the canton of Neuchâtel. 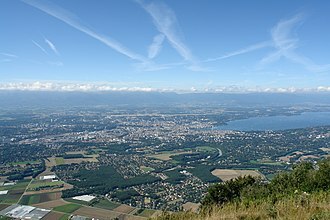 It is located in the Jura mountains at an altitude of 1000 m, after Geneva and Lausanne, it is the third largest city located completely in the Romandie, the French-speaking part of the country, with a population of 38,957. The city was founded in 1656 and its growth and prosperity is mainly bound up with the watch making industry. It is the most important centre of the watch making industry in the known as the Watch Valley. Completely destroyed by a fire in 1794 La Chaux-de-Fonds was rebuilt following a street plan. Karl Marx said about the special urban design of the city that it was a city-factory. The famous architect Le Corbusier, the writer Blaise Cendrars and the car maker Louis Chevrolet were born there, La Chaux-de-Fonds is a renowned centre of Art nouveau. In 2009, La Chaux-de-Fonds and Le Locle, its city, have jointly been awarded UNESCO World Heritage status for their exceptional universal value. The watch making cities of La Chaux-de-Fonds and Le Locle have jointly received recognition from UNESCO for their exceptional universal value, the Sites planning consists of two small cities located close to each other in the mountainous environment of the Swiss Jura. Due to the altitude and the lack of water the land is ill suited to farming and buildings reflect the watch-making artisans need of rational organization. Both agglomerations present outstanding examples of mono-industrial manufacturing-towns, which are still well-preserved, the urban planning has accommodated the transition from the artisans’ production of a cottage industry to the more concentrated factory production of the late 19th and 20th centuries. In 1867 Karl Marx was already describing La Chaux-de-Fonds as a “huge factory-town” in Das Kapital, where he analyzed the division of labour in the watch making industry of the Jura. It is the tenth Swiss Site to be awarded World Heritage status, joining others such as the Old City of Bern, the Rhaetian Railway, the region was first inhabited around 10,000 years ago. Thun is a town and a municipality in the administrative district of Thun in the canton of Bern in Switzerland with about 43,783 inhabitants, as of 31 December 2013. It is located where the Aare flows out of Lake Thun,30 kilometres south of Bern, besides tourism and precision instrument engineering, the largest garrison in the country, the food industry and publishing are of economic importance to Thun. 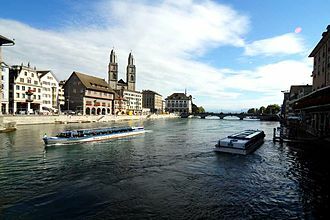 The official language of Thun is German, but the spoken language is the local variant of the Alemannic Swiss German dialect. The area of what is now Thun was inhabited since the Neolithic age, during the early Bronze Age there were a number of settlements along the lake shore and the Aare. A site at Renzenbühl had a chief or noblemans grave which contained one of the richest collections of early Bronze Age artifacts in Europe. Another site at Wiler contained approximately 1,500 maritime snail shells which were harvested from the Mediterranean, the name of the town derives from the Celtic term Dunum, meaning fortified town. It fell to Rome in 58 BC, when Roman legions conquered almost all of Switzerland, the Romans were driven out of Thun, and out of the rest of Switzerland, by the Burgundians around 400 AD. The Aare became the frontier between the Christian Burgundians and the Pagan, German-speaking Alemanni, who lived north, the region was mentioned for the first time during the 7th century, in the chronicle of Frankish monk Fredgar. 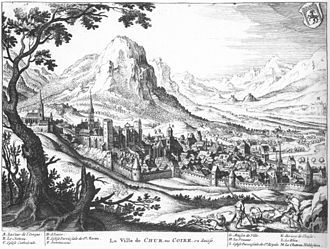 The town is first mentioned in 1133 as Tuno, the region of Thun became a part of the Holy Roman Empire in 1033, when Conrad II gained the title of King of Burgundy. The emperors entrusted the Zähringen family, centred in Bern, with subduing the unruly nobles of central Switzerland, around 1190 Duke Bertold V of Zähringen, built Thun castle and expanded the town. After Bertolds death in 1218, his territories went to Ulrich III von Kyburg, in 1264 Thun received town rights and in 1384 the town was bought by the canton of Bern. Thun was the capital of the Canton of Oberland of the Helvetic Republic, in 1819 a Military School was founded in the town, which developed into the main military school in Switzerland. Herisau is a municipality of the canton of Appenzell Ausserrhoden in Switzerland. It is the seat of the government and parliament, the judicial authorities are situated in Trogen. Together with other Alpine towns Herisau engages in the Alpine Town of the Year Association for the implementation of the Alpine Convention to achieve sustainable development in the Alpine Arc, Herisau was awarded Alpine Town of the Year 2003. Herisau was first mentioned in 837 as Herinisauva, and its church is mentioned in 907, in 1084 Herisau was destroyed as part of battles around the monastery in St. Gallen. In 1248 and 1249 the town was destroyed again, this time by the monastery to establish loyalty, in 1401 Herisau joined an alliance with other places in Appenzell as part of the Appenzell Wars. Between 1517 and 1518 Herisau managed to buy itself free from the monastery, the town hall was built in 1601. In 1606 the town was destroyed by a fire. In 1648 Schwellbrunn separated and became an independent village, between 1798 and 1803 Herisau was the capital of the canton Säntis. Herisau has an area, as of 2006, of 25.2 km2, of this area,56. 8% is used for agricultural purposes, while 27. 1% is forested. Of the rest of the land,15. 5% is settled, the municipality is located in the former District of Hinterland. It is located at the point of two major routes through the region, the St. Gallen-Toggenburg road and the Gossau-Appenzell road. 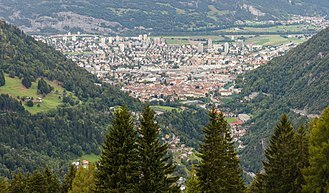 In addition to being the capital of the canton, about one-third of the population of the entire half canton lives in Herisau. It consists of the village of Herisau and scattered hamlets as well as bedroom communities, before 1648 it controlled about twice the land area as is currently part of the municipality. Until 1648 Schwellbrunn was part of the municipality and until 1720, Herisau has a population of 15,527, of which about 17. 9% are foreign nationals. Over the last 10 years the population has decreased at a rate of -5. 2%, most of the population speaks German, with Serbo-Croatian being second most common and Italian being third. As of 2000, the distribution of the population was 49. 6% male and 50. 4% female. 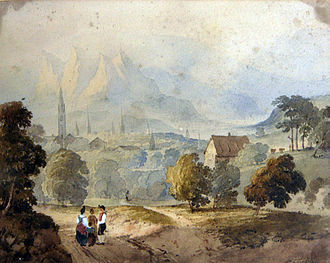 Watercolour drawing of Coire/Chur/Coira by Francis Nicholson (1753-1844). The Burgdorf castle, first built in 1175, now contains a museum founded in 1886.